Yearning to go from flab to fab? The Sole Elliptical Machine may be just the fat-burning exercise buddy you need to get your body-transformation on the right track. Imagine seeing the lean, toned lines you desire in the mirror and slipping effortlessly into that skin-tight pair of jeans. According to Sole Elliptical Machine reviews, these blubber-busting trainers are made to match your workout efforts step by step. Sole Elliptical is so confident about its line of trainers that they offer a 30 day trial period, after which you can get your money back if you are not absolutely delighted with your purchase. How is that for trust in a product? For more than 20 years this Sole has been specializing in turning couch potatoes into calorie crunching consumers. Their electronic treadmills can be found in hotel rooms throughout the hospitality industry, where they stand up well to heavy-duty usage. Why are virtually all the Sole Elliptical Machine reviews so positive about this collection? It has to do with quality components, innovative engineering, reassuring warranty periods and top-rated customer service. Add to this the fact that this brand’s engineering team came up with a solution for the foot pedal problems that plague the industry, and you have a winning combination. If your body’s alignment is out of kilter due to the position and action of the foot pedals, you may experience discomfort in your knees, hips and back. Normally, the inclination is to move the pedals closer to each other in order to solve alignment problems. Sole Elliptical Machines came up with a different approach. The angle of the pedals were adjusted inwardly – a tiny, but crucial change. Another issue the engineering team addressed successfully, was that of numb toes after working out for a while. Some knee aches were also not relieved by the angle modification alone. After careful study, the two top-level models got the benefit of an adjustable footpad, in addition to its articulating action. By changing the angle up or down, all the hiccups could be solved. As if this wasn’t enough, these guys discovered that the change generated additional benefits. When you adjust the angle of the foot pedals, you will find that your hamstrings or glutes get an enhanced, more intense workout. It is clear that you have to be super careful when buying an elliptical exercise machine. You need to test the trainer thoroughly. Remember that the extras are not all-important. You need to concentrate on the stability, smoothness and comfort of the action. All the bells and whistles in the world won’t get you to train if you experience pain or discomfort after 10 minutes on the machine. If you are not comfortable over a workout period of 20 or 30 minutes, you won’t complete your session. 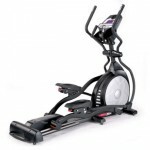 The idea behind Sole Elliptical Machines and the other brands are that they should move the way you do. The ellipse pattern should emulate your walking pattern as closely as possible. Viewed as one of the best in the below $1000 class, this total body exercise machine offers a smooth action with great stability. It is quiet enough not to interfere with the soap you take in while training. It features a 20″ stride length, and the comfortable foot pedals the brand has become known for. It sports a brawny buffet with 10 programs. One of these can be customized according to your individual needs. This trainer cheerfully carries up to 325 pounds in user weight. The sturdy frame comes with a lifetime warranty, while the parts and electronics are covered for three years. The labor warranty stretches over 1 year. It is no longer surprising to see a ‘Best Buy’ tag on this brand’s elliptical exercise equipment. This design encourages you to work every major muscle group maximally. There is no need to lose your cool while sweating it out, as the equipment comes with a built-in cooling fan and a water bottle holder. Handgrip pulse sensors on the stationary handlebars enable you to zone in on your target heart rate. The foot pedals with their 2 degree inward slope have been designed for user comfort during longer workouts. The 20″ stride length should accommodate most fitness buffs. The frame comes with the hallmark lifetime warranty, while parts and electronics are covered for 5 years, and labor for 2 years. Read our full detailed review of the Sole E35 Elliptical Trainer – we loved it! Ready to rock-’n-roll? Here you have all the regular Sole Elliptical Machine benefits, plus a larger display and a heart rate monitor with chest strap. The easy-to-read LCD blue back-lit electronic console with its health-club features allows for plenty of feedback fun and a continuous data diet. Sixteen levels of resistance and 10 programs test your mettle and get you into the best shape of your life. The E55’s stride length is the customary 20 inches. User comfort is seen to with the addition of a built-in fan and water bottle holders. The robust frame has lifetime coverage, while parts and electronics come with a 5 year warranty. Labor is covered for two years. Now we’re playing with the big boys. You will enjoy making use of the custom molded hand grips on the movable handlebars during upper body routines. The heart rate monitor allows you to make good use of the heart rate interactive programs. You can rest your feet comfortably inside the sloped, over-sized foot pedals with their foam cushioning. Here you have the benefit of utilizing the innovative adjustable pedal angle. Four rear wheels give extra stability. This well-muscled fat-burner deems itself fit enough to carry up to 400 pounds in user weight. It sports the trademark lengthy warranty. The E95 has all the characteristics to do battle with models in the over $2500 class, yet it comes in at around $1700. Sole Elliptical Machines not only feature solid, quality components, but an equally solid reputation in the fitness industry.